Spyro has been unleashed! He's all scaled up and ready to flare up some bad guys in Spyro™ Reignited Trilogy, a dynamic gaming collection that's going to have fans "Spyro-ing" out of control. In Spyro™ Reignited Trilogy, gliding to new heights, unleashing fire-breathing attacks, and exploring lush environments is more fun in HD graphical glory. Spyro™ Reignited Trilogy introduces players to a fully remastered game collection of the three original Spyro™ games that started the phenomenon: Spyro™ the Dragon, Spyro™ 2: Ripto's Rage! and Spyro™: Year of the Dragon. 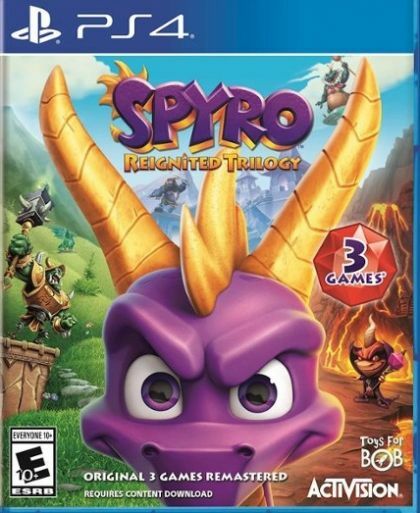 Remade from the ground up by lead developer Toys for Bob, the Spyro Reignited Trilogy features the fun and nostalgic gameplay that fans remember with more than 100 levels, enhanced reward sequences, Spyro's gang of zany dragons and other goofballs (including Sparx the Dragonfly, Hunter, Sheila, Agent 9 and Sgt. Byrd) and more. The trilogy also includes improved environments, updated controls, brand-new lighting and recreated cinematics for added flavour in this one-of-a-kind adventure. Spyro Reignited Trilogy is an awesome gaming experience that builds on the excellence of the first three games. Each level in Spyro Reignited Trilogy is mapped faithfully from the originals. The characters are creatively re-imagined with additional flair allowing fans to rekindle the fire with Spyro and his crew like never-before. Players will experience a trilogy that's loaded with an astonishing amount of detail, refreshed modern day mechanics, full analog stick support and smooth camera handling. Spyro Reignited Trilogy also re-imagines Stewart Copeland's original soundtrack from the first three games.